Shai'tan wrote: Here is a pretty decent list over engines and what they can be used for. Anonymously Famous wrote: Say I wanted to make a fairly basic 2D side scroller. What game development platforms would you recommend? I have Clickteam Fusion from a recent Humble Bundle thing, and there's also Unity and other popular environments. There are also other things like Pygame for Python game development, etc. I just need a starting spot, I guess. Unity is very versatile, and I kinda like it. It may or may not be worthwhile for you to get into, depending on how much would you like to achieve. I've never used Clickteam Fusion, but from what I can tell, it might be easier to use for simple stuff like this than Unity. No idea about pygame, I guess since you like python it should be easy enough for you. Really it depends on whether or not you'd like to move on from the simplest side scroller and do something more later, in which case it would be best to start with something that can give you more options and freedom down the line. Or if you just want to throw together something quick. Also, thanks, atom, for your reference links. I'll be sure to look at them! So I guess I've narrowed things down somewhat. Now I just need to do the hard parts: Look into the engines/frameworks, and find time to actually do stuff! I find that finding time is the toughest part. Shai'tan wrote: I find that finding time is the toughest part. with free gamemaker. You'll get used to the front end backend thing, and naming conventions. Just as a thing to do, especially with their latest updates GameMaker is looking real good (resource use wise, they have tuned up the engine and language a lot). After that I'd branch out to unity/unreal for anything, because they are just more powerful in general. Thanks, lunar! I'll take a look at it! Edit: Of course, now I've found a lot of other cool new frameworks and engines and such... I think I just need to pick one and get going on it. Anonymously Famous wrote: Thanks, lunar! I'll take a look at it! How's your regular programming skills? There's a logic flaw in your code. It doesn't account for "excellent" or "expert". I'm okay with programming. I also saw that GameMaker isn't the only one that has little to no coding involved, so there would still be several options. I thought Godot looked interesting, so I downloaded that last night and looked at it a little. I'll probably go through some tutorials later this week or something. It looks like the script it uses is Python-based, and since I use Python more than any other programming language (though I've used several), I thought it might be good. Anonymously Famous wrote: There's a logic flaw in your code. It doesn't account for "excellent" or "expert". or codeless if you want. Godot I believe does the same though now that I think about it. You should keep us up to date on your experiments and lessons! I'm curious to see how it is as a platform. Anonymously Famous wrote: I thought Godot looked interesting, so I downloaded that last night and looked at it a little. So every time it's compiling or slows down for some reason, you can say that you're... waiting for Godot? lunar: I haven't had/made much time for it, but I have gone through some of the tutorials. It has a 2D and a 3D mode, each of which use different engines (which makes it more efficient than Unity for 2D games). First impressions are that it's much like Visual Studio, in that you use a WYSIWYG type environment to set up your objects, and then a code editor environment to add event handlers, etc. One thing I like about Godot, probably because of who I am, is that they make it easy to import and export your strings for translation. I'm not sure how other game engines handle that, because I haven't looked into them much. Humble Bundle currently has a bundle that includes Game Maker: Studio Professional and the modules for HTML5, iOS, Android, and Windows UWP (Windows Mobile, basically). There's also a bundle with eBooks for Unity and Unreal Engine. I can only rationalize one, so I think I'll go with the one that actually has the game creation environment (plus some games) instead of the one that has a bunch of books about environments (though those environments are free). Decisions, decisions... ACTUALLY... I can rationalize one full bundle and a lower tier of the other, so maybe I'll get some eBooks, too. it's still in development, but it looks like it's going to be a cool learning tool / actual tool for making animated little movies or games, just like flash. That's pretty cool. And it's all cloud based? 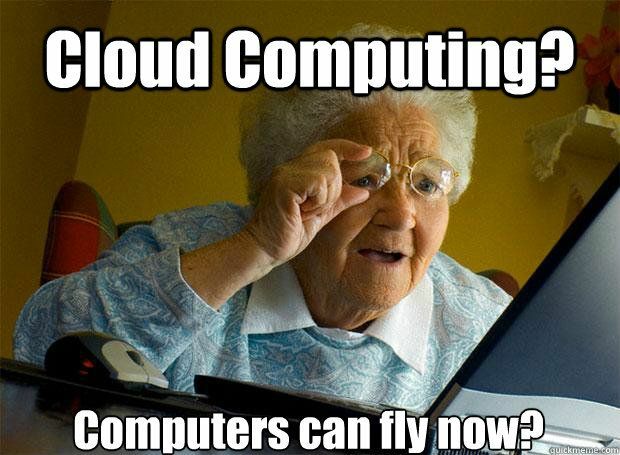 computer-like things flew to the Moon when you were in your twenties, grandma. A flat, rendered image, to demonstrate the nightmare of not having some access to the text. I made sure to use a background in the image, too, so that it wouldn't be as easy as erasing the text and putting in the translated text. Anyway, I thought that was close enough to the topic of this thread to warrant posting it here. I think we should change the subject of this thread to be "General computer nerdery"
Isn't that pretty much what it already means?